Arthrocentesis, or joint aspiration, is the removal of synovial fluid from a joint cavity. [1, 2, 3] The fluid removed may be used for diagnostic or therapeutic purposes. Diagnostically, the procedure may be used to elucidate the etiology of acute arthritis, diagnose a septic joint, or identify an intra-articular fracture or effusion. Therapeutically, joint aspiration can alleviate pain secondary to intra-articular pressure from an effusion or drain septic fluid. It can also be used for a pharmaceutical trial of intra-articular pain medication. Synovial fluid analysis provides pertinent information regarding the composition of fluid in an affected joint suspicious for arthritis, gout, or intraarticular infection. Analysis includes, but is not limited to, identification of crystals, white blood cell (WBC) count, and Gram stain. Fluid may be aspirated from almost any joint. 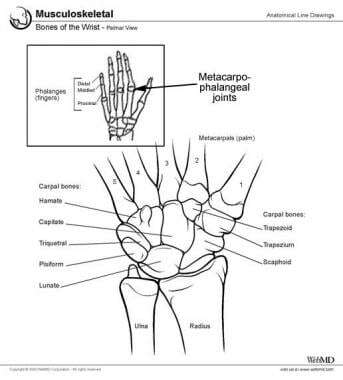 The metacarpophalangeal (MCP) joint is often aspirated when a clinical suspicion for monoarticular or polyarticular arthritis exists. Because the MCP joint is the principal joint for function of the fingers, arthritic destruction of this joint can have devastating deforming effects and can limit hand function. Early diagnosis of MCP pathology is important, whether it be arthritis, infection, or gout. Arthrocentesis may also be used as a therapeutic modality, relieving the pressure and subsequent discomfort associated with a large effusion. An effusion places undue stress on the joint capsule, resulting in pain and limited mobility. In the case of a septic joint, the aspiration of fluid not only alleviates pain but also decreases the bacterial load in the joint, theoretically limiting joint destruction. Joint aspiration also has a role in traumatic arthritides. Joint aspirate may be bloody with many red blood cells (RBCs) or may contain fat globules. Both findings are associated with an intra-articular fracture into the marrow cavity or disruption of intra-articular structures. No absolute contraindications exist for MCP arthrocentesis. All contraindications are relative. As with any procedure, the risks and benefits should be discussed with the patient and informed consent obtained. The two most pertinent risks are infection and hemorrhage. Overlying cellulitis of the joint is a relative contraindication, in that contamination of the joint may result from the needle passing through the skin and seeding the joint cavity. The exception is a suspected septic joint; the benefit of joint aspiration outweighs any relative contraindications when compared to the morbidity of an undiagnosed septic arthritis. When the needle is passed through a potential or obvious infection source, antibiotic treatment should be initiated. Arthrocentesis should be avoided in patients with bacteremia or sepsis, except to rule out septic arthritis. The anatomy of the MCP joint is illustrated in the image below. Patient body habitus—specifically, morbid obesity—may make joint aspiration technically difficult. In this patient population, anatomic landmarks may be skewed or difficult to identify. Zayat AS, Buch M, Wakefield RJ. Arthrocentesis and injection of joints and soft tissue. Firestein GS, Budd RC, Gabriel SE, MacInnes IB, O'Dell JR, eds. Kelley and Firestein's Textbook of Rheumatology. 10th ed. Philadelphia: Elsevier; 2017. Vol 1: 802-16. Springer BL, Pennington BM. Joint arthrocentesis in the emergency department. Relias Media. Available at https://www.reliasmedia.com/articles/141511-joint-arthrocentesis-in-the-emergency-department. October 1, 2017; Accessed: October 19, 2018. Fields TR, Berman JR. HSS Manual Ch. 8 – Arthrocentesis, intra-articular injection and synovial fluid analysis. Hospital for Special Surgery. Available at https://www.hss.edu/professional-conditions_hss-manual-ch8-arthrocentesis-intra-articular-injection-synovial-fluid-analysis.asp. August 22, 2016; Accessed: October 19, 2018. Feldon F, Terrono AL, Nalebuff EA, Millender LH. Rheumatoid arthritis and other connective tissue diseases. Wolfe SW, Hotchkiss RN, Pederson WC, Kozin SH, Cohen MS, eds. Green's Operative Hand Surgery. 7th ed. Philadelphia: Elsevier; 2017. Vol 2: 1832-903. [Guideline] Rheumatoid arthritis: diagnosis, management and monitoring. British Columbia Medical Services Commission. Available at http://www2.gov.bc.ca/assets/gov/health/practitioner-pro/bc-guidelines/rheumatoid_arthritis.pdf. September 30, 2012; Accessed: October 19, 2018. Reichman EF, Larkin J, Euerle B. Arthrocentesis. Reichman EF, ed. Emergency Medicine Procedures. 2nd ed. New York: McGraw-Hill; 2013. Chap 77.